In arguably the game of the day University of Limerick Women’s produced a fantastic second half performance to overcome a spirited Dublin City University team that tried right to the very end. It was UL who started the brighter in a game where both sides were determined to keep the ball in hand and play exciting expansive rugby. It made for a fantastic spectacle and the crowd really created a wonderful atmosphere throughout. UL’s early pressure payed off and they scored a try through winger Ashlee Sheehy form Tralee RFC. The subsequent conversion attempt was missed and so UL led 5-0 after sixteen minutes. However, for the remainder of the first half DCU took control of the match and it took them only five minutes to reply to the UL try with one of their own. Outside centre Anna Doyle from Tullow RFC crossed the line to touch down for an excellently worked try which levelled the scores 5-5. DCU kept the pressure on until half time and an excellent penalty kick after thirty-six minutes from out-half Ciara McDonnell gave the Dublin University a deserved lead. The first half ended DCU 8 UL 5. The second half saw a huge swing in momentum with UL coming fast out of the blocks to put DCU back under severe pressure. A superb breakaway move by UL was just held up over the try line by brilliant last ditch defending by DCU. But ten minutes into the second half UL regained the lead through a well worked try by Number 8 Deirbhile Nic A Bhaird just to the left of the posts. Out-half Rebecca Gavin successfully converted to stretch UL into a 12-8 lead. DCU to their credit fought as hard as they could to get back into the game, but they were met with a dogged and determined UL defence. The open rugby and brilliant attacking play continued right throughout an energy sapping second half. The vital score of the game came almost twenty-five minutes into the second half when the outstanding Deirbhile Nic A Bhaird scored an absolutely mesmeric solo try after picking the ball up just inside the DCU half of the field. She showed great strength pace and footwork to slalom her way to the try line. The lead was now nine points and try as they might DCU could not break down the UL defence although they did come very close on a couple of occasions. In the end the score remained UL 17 DCU 8 at the final whistle. There were scenes of both joy and heartbreak at the end of what was a fantastic advertisement for Women’s third level Rugby in Ireland. UL on the day were deserving winners but DCU can be extremely proud of their effort. Emily McMahon (Kilrush RFC), Rachael Dunne (Tullamore RFC), Elizabeth McNicholas (Tuam/Shannon RFC), Eadaoin Liddy (Mullingar RFC), Ciara McLoughlin, Sorcha Ni Uallachain (UL Bohs), Jessica Hewitt, Deirbhile Nic A Bhaird (UL Bohs), Helen McDermott (UL Bohs), Rebecca Gavin (Castlebar RFC), Kate English, Enya Breen (Bantry Bay RFC), Clodagh Hanniffy (Tullamore RFC), Ashlea Sheehy (Tralee RFC), Rosie Newton, subs Mary Lambert (Kilkenny RFC), Meadhbh O’Dwyer (New Ross RFC), Aoife O’Grady, Sinead Hogg (Richmond RFC), Meadhbh Lewis, Aine Lucey, Stephanie Carroll. 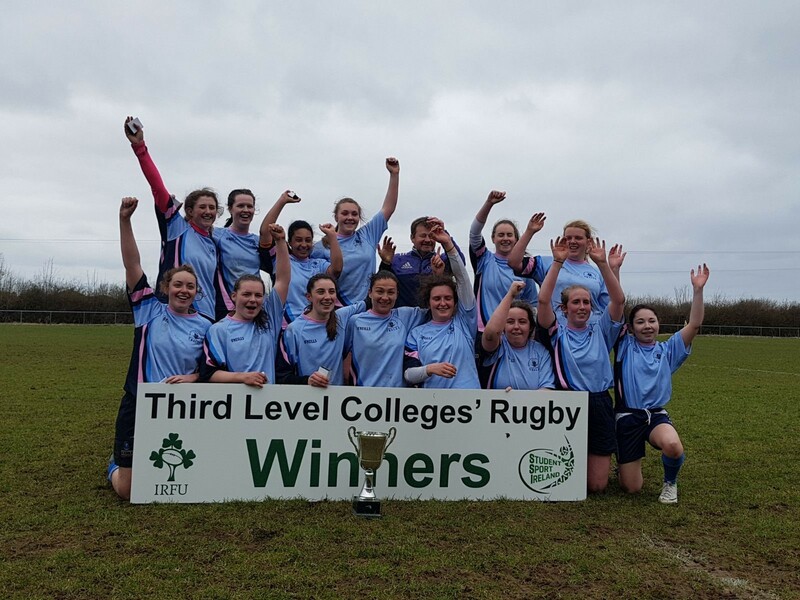 Emma lackey (St Mary’s College RFC), Laura Power (St Mary’s College RFC) , Caroline Quirke (Thurles RFC), Joanne McSorley, Sophie Kilburn (Garda RFC), Ann Marie Dunphy, Aine Reilly (Ardee RFC), Mairead Hopkins (Ballina RFC), Niamh Griffin (Blackrock RFC), Ciara McDonnell (Garda RFC), Aine Lyons (St Mary’s College RFC), Emma Hooban (St Mary’s College RFC), Anna Doyle (Tullow RFC), Keely Doonan, Kate Cullen, subs Katie O’Brien (Tullamore RFC), Eva Kealy (Tullow RFC), Helen Boylan, Muireann Scully, Louise McCleery (Boyne RFC), Molly Scuffil-McCabe (Garda RFC), Rachael Armitage Ext Panel Kerri McGloin, Leona Byrne, Rachel Mulholland, Patrice O’Gorman, Abby O’Regan, Soha Smyth, Ellen Butler, Juliette Lecomte. Preceding the Division 1 final was the Division 1 Shield Final between UCC and UCD. In another highly entertaining game it was UCC who were just too strong for UCD and ran out 28-19 winners. UCD were the first to strike after sixteen minutes with their impressive scrum-half Heather Cullen from Rathdrum crossing the whitewash. However, that would turn out to be the only time the Dublin side led in the match. Three converted tries without reply for UCC before half time put them in a very strong position. 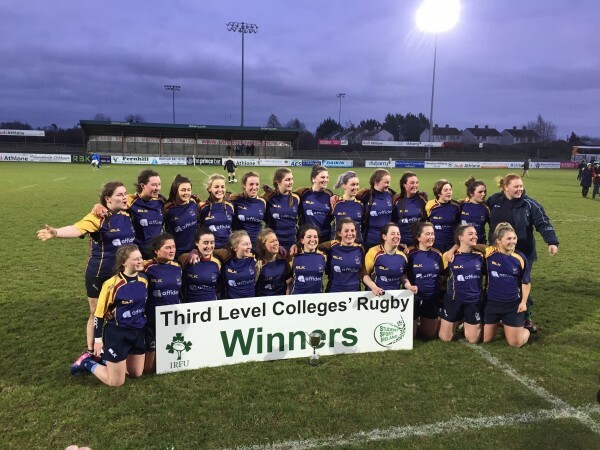 The tries were scored by inside centre Hannah O’Sullivan, tight head prop Naoise Murray and openside flanker Ciara O’Dwyer all of who represent Highfield RFC. Scrum half Laura Delaney was flawless with the boot in the first half and added the extras for each of the tries to give UCC a 28-5 lead at the break. The start of the second half continued much like the first with UCC adding another converted try with Hannah O’Sullivan crossing the line for the second time. UCD showed fantastic resolve and fight to take control of the rest of the match scoring two converted tries. Heather Cullen scored both tires to complete her hat-trick. She converted her first one and Christine Coffey from Old Belvedere converted the second. However, UCC held on and saw out the final minutes. Earlier in the day IT Tralee and University of Limerick B team met in the Women’s Division 2 Final. It was IT Tralee who took home the cup but in truth this was a match that could have gone either way, with a final score line of 19-17 to IT Tralee. The game was only six minutes old when Rosie Somers crossed the line for IT Tralee. Jamie Mullins from Tralee RFC added the extras and her ability to convert the IT Tralee tries in this game proved to be decisive in the end. It took UL just four minutes to respond with a try of their own through Stephanie Carroll. The conversion attempt was unsuccessful, and IT Tralee led 7-5 at half time. The lead swapped hands four times in the second half with the result in doubt right up to the final whistle. First a try by Michelle O’Driscoll which was converted by Mairead O’Sullivan gave UL a five-point lead,12-7. IT Tralee hit back through full back Andrea Harmon with Jamie Mullins kicking the conversion. IT Tralee’s three-point lead was overturned yet again by UL and Stephanie Carroll who got her second try of the game. This meant that UL led 17-14 coming into the closing stages. However, IT Tralee got the winning try with Yvonne O’Shea from Bantry RFC proving to be the match winner. 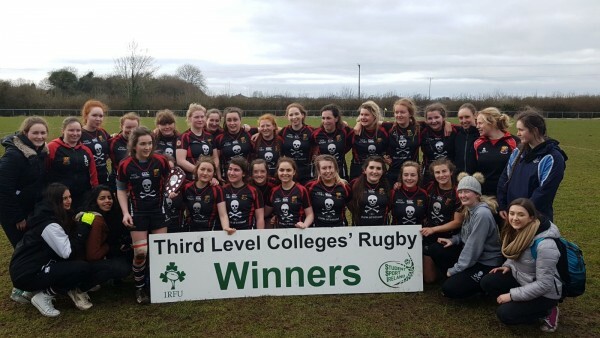 Overall the three Women’s matches played in Buccaneers RFC Dubarry Park were of a fantastic standard and were played in a great spirit. Congratulations to the three winning teams and commiserations to the losing teams who can all be proud of how they contributed to a fantastic day of women’s third level rugby.